Nowadays, two of the most frequently discussed topics in the media are perhaps the growing gap between rich and poor, and the challenges presented by Artificial Intelligence (AI). These two problems are mentioned in my sci-fi novelette Folding Beijing , and people still haven’t found satisfactory solutions to them. The causes of the widening social gap are various: globalization, the financial system, political policies, and, the most important one, the replacement of workers by automation. As AI becomes more advanced, it is expected that it will replace more and more jobs now done by humans, increasing joblessness and social inequality. These problems are not easy to solve. Social welfare can help people survive, but it cannot help create hope. If countries cannot make proper preparations for these challenges, they may face extremely difficult challenges in having to deal with joblessness and social crises. Only education can provide the tools to tackle the problem of inequality in the future. Requirements for jobs in the age of AI are quite different to those in the industrial era. 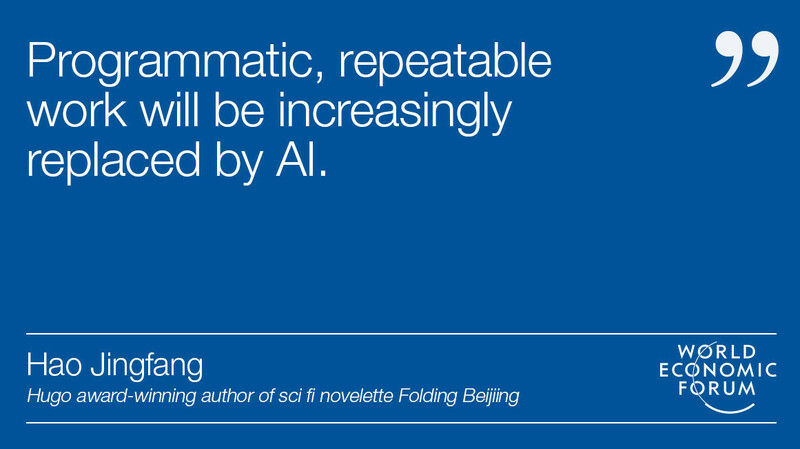 Programmatic, repeatable work will be increasingly replaced by AI; while new jobs will require much more creative thinking, something that in many countries is not normally the main focus of the educational system. What, then, should education do to solve the problem of inequality and lack of creativity? In my view, the most important thing is to produce and share educational programmes that promote creativity. First, we need a group of professionals who can lead the design of innovative educational programmes, including the content and teaching methods. These should allow students to learn in explorative, creative ways, and focus on promoting the habits of self-learning and independent thinking, and make creative thinking the most important goal. Second, these innovative programmes should be shared broadly, by all children. Nowadays, in many countries, education has become a high-price commodity, serving as the tool of an elite group to keep their social status advantages. This undoubtedly exacerbates the problem of social inequality. In addition to innovation in educational content, it is equally important to improve sharing mechanisms if we are to make progress. We need to help all children, whatever their families’ status, to have the same opportunities to train and develop their creative thinking. Traditionally, people have often considered creativity to be a set of special talents belonging to a few individuals; they saw it as a sign of genius, as a gift, and something brought about through inspiration. However, new psychological studies suggest there are some common traits in the creative thinking processes. One prominent feature is the feasible transition between divergent thinking and convergent thinking, which can be practised in classes. The capacity to identify and then solve problems can be practised as well. These traits can be trained through designed programmes. Teachers can ask more open questions, encourage students to give independent solutions, let them learn in creative ways, and establish virtuous cycles of explore-study-create in class. Can this educational innovation be inclusive? Traditionally, high-quality education has depended on face-to-face teaching by distinguished teachers, and so it was more or less restricted to prestigious campuses. With new technologies, however, high-quality education can be promoted in a much broader way. Internet courses can offer people free or low-price education, online applications, and AI techniques can help students learn by themselves; and this new teacher-training system can help spread innovative classes at relatively low cost. Only by these new paths, can all children share the advantages of educational innovation. Educational equality and educational innovation will be, I believe, the most important social issues in the future. I hope to contribute my own energy into this meaningful process. As a result, my friends and I have launched a new programme called “WePlan”, in order to explore programmes that promote creative thinking and share these new explorations with all kids in an inclusive way. Our hope is that children from all families can share high-quality educational resources, and so share a future together.